May 25, 2016 – “Sustainable fishing” may sound simple, but measuring whether or not a fishing operation is sustainable is actually quite complex, requiring plenty of research and data. Fisheries scientists dedicate their time to studying how fishing can be balanced so as to allow aquatic species to maintain thriving populations, in a dynamically fluctuating and changing environment. Decades of research and managers’ experiences, trying to apply scientific advice on the ground, have shaped current practices in monitoring and managing fisheries sustainably. The MSC certification requirements for fish stocks conform to the United Nations Food and Agriculture Organisation (FAO) Code of Conduct for Responsible Fishing and the FAO Ecolabelling guidelines. They also reflect international scientific consensus on best practice for interpreting such guidelines, and are consistent with the recommendations of several national and international scientific advisory bodies such as the US National Oceanic and Atmospheric Organization (NOAA) and the International Council for the Exploration of the Sea (ICES). So what is required for a stock to be fished “sustainably” according to the MSC Fishery Standard? And how do we measure whether an MSC certified stock is healthy, or headed in the right direction? The weight, or biomass, of the targeted population (B or more specifically SSB, see below). Other factors also play a role, including the abundance of predators, availability of food, environmental variability, disruption of climate cycles, etc. The effectiveness of the management system in constraining fishing pressure within sustainable limits is also critical. When a ‘virgin’, or previously unfished population is first harvested, its biomass will initially decline as a result of fishing. But there is a point where a roughly constant harvest can be maintained indefinitely without causing decline in the population, and where the productivity of the population is at its maximum. The dynamic equilibrium between fishing and replenishment is what we consider a sustainable fishing level. The maximum catch that can be harvested sustainably is called the Maximum Sustainable Yield (MSY). The stock biomass required to support MSY is known as BMSY. At BMSY fishing is considered to be sustainable indefinitely, with a fishing pressure of FMSY. Fishing more than this, leads to sub-optimal harvest, where increasing fishing pressure yields smaller catches (Fig. 1). Overfishing can, in the long run, become unsustainable when the population declines to the point that there aren’t enough large, mature fish (the ‘spawners’, making up the spawning stock biomass, SSB) to reproduce, or young fish to grow, and replenish the fish that are harvested. (Yes, size matters: it’s important to know how many larger mature animals there are because they produce more and healthier offspring, and it’s also important to know how many juveniles there are that can grow into next year’s available catch, but, for sake of simplicity, we will just talk about total SSB here). This stage, when new generations are insufficient to replace the old, is known as the Point of Recruitment Impairment (PRI). Figure 1. Maximum Sustainable Yield – where fishing can continue indefinitely. Each aquatic population has its own specific BMSY, FMSY, and MSY. In addition, as other factors such as climate, food and predators vary, so does the maximum biomass that the environment can support, or the amount of fishing that the population can compensate for. Therefore MSY is not a static number: the size of populations and the amount of fishing they can sustain changes dynamically. As it’s impossible to count and measure all fish in the sea, biomass and fishing pressure are never measured directly. They are inferred through models, knowledge of species biology, and information collected every year on fisheries activities and scientific surveys. So, how can we manage fisheries towards a goal that is ever changing and so elusive to measure? In practice, fisheries scientists usually estimate an average value that this ideal stock biomass is likely to fluctuate around. Rather than expecting stocks to be exactly at BMSY at all times – which would be incredibly challenging to monitor in real time, given the variability and natural fluctuations of wild populations – scientists delimit a range of values that are considered a ‘safe space’ within which the stock is not at risk. This space is bound by thresholds that, when crossed, signal to managers that they need to intervene. They may identify several reference points, representing different levels of risk and urgency of intervention, and the way these are used can vary from stock to stock. Different advice bodies, in regions such as Europe and the USA have developed slightly different types of metrics and associated harvest control rules. In all these regions, however, their purpose is to have a tractable way of ensuring that stocks are maintained, on average, around BMSY, despite the variability and difficulty of directly and accurately measuring BMSY. This makes sure that any risks due to uncertainty are dealt with using sufficient precaution. Good monitoring and management practices ensure that if, for any reason, stock biomass drops below a reference level, a remedial action is put in place, such as a reduction in fishing time or in catch limits, allowing stocks to recover. An example of this can be seen with the MSC certified New Zealand hoki fishery which reduced catches, allowing the stock to recover. To be certified to the MSC Standard with no ‘conditions’, or actions to maintain certification (i.e. to receive a score of between 80 and 100 for stock status) fisheries must be targeting stocks which are fluctuating around BMSY , are being fished at a level which maintains this, and have a management system that is responsive to changing information and capable of ensuring that the stock status and fishing pressure remain sustainable. The MSC also seeks to drive positive change. Where fishing pressure is higher, or fish stock biomass lower, than the values in the ‘safe zone’, fisheries can be certified with a time-bound request to address the issue, allowing the stock to recover. Failure to do so results in a suspension of the validity of their certification.Figure 2. Green: No conditions. Amber: Conditions to reduce fishing pressure. Red: Fishing or biomass is outside a ‘safe zone’ and therefore cannot be certified to the MSC Standard. Figure 2. Green: No conditions. Amber: Conditions to reduce fishing pressure. Red: Fishing or biomass is outside a ‘safe zone’ and therefore cannot be certified to the MSC Standard. have confidence that the management system, and the strategy that it follows, is robust. A useful analogy is to think of a sustainable fishery as a business that is perfectly balancing earnings and expenses, and a rebuilding fishery as a business that has taken out a loan, and is gradually repaying it by spending less than it earns. On the other hand, a collapsed fishery is one that overspent, and, instead of repaying its debts, kept on spending and accruing interest, until financial collapse. An analysis of fisheries before and after MSC certification in Europe, shows that their health has improved over the last 15 years.This reconfirms similar analysis published in 2012. To illustrate this, we plotted the ratio of fishing pressure, F, over the reference point FMSY, against the ratio of population biomass, B, over the ICES reference point MSY-Btrigger. The relationship between Btrigger and BMSY can vary a lot from species to species, so we can’t know exactly how far stocks are from BMSY. Based on ICES advice, a B/Btrigger ratio of 1 or above means that the population biomass can be considered within a safe range, and to be fluctuating around BMSY. 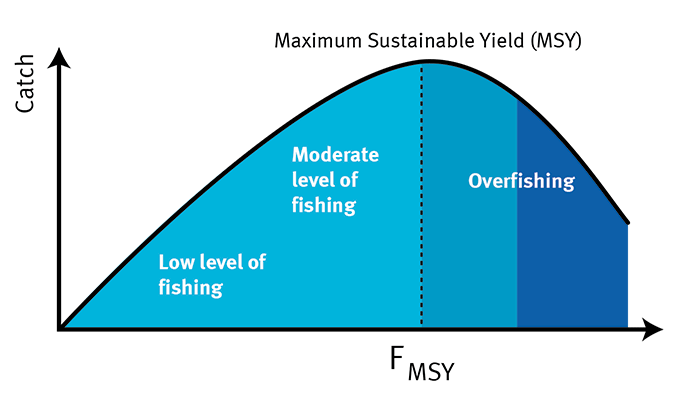 A ratio of 1 for F/ FMSY means fishing pressure is exactly at the level required to achieve MSY, and anything above 1 constitutes overfishing (figure 3). ICES’ recommendation uses Btrigger as one of its management reference points. When stock biomass goes below this point, managers should intervene and reduce fishing pressure below FMSY or establish a rebuilding plan. 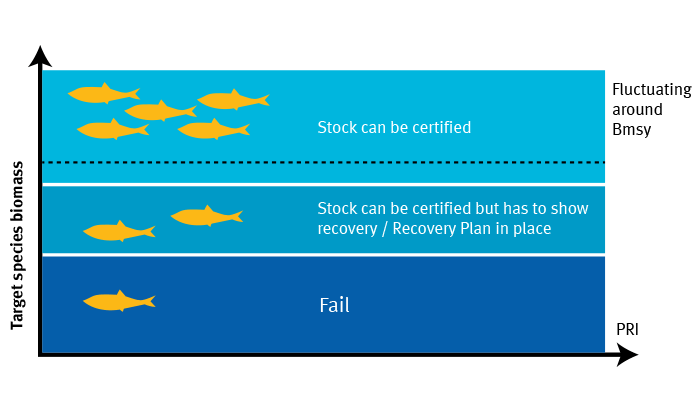 If any stocks certified by MSC fisheries are in this situation, the MSC Standard requires a time-bound commitment to rectify it. If the fishery fails to fulfil the promised improvements in time, it is suspended from the program. Therefore, to maintain the benefits of certification, fisheries can be in the lower left quadrant only temporarily. Figure 3. Illustration of how to interpret a kobe plot to visualize if stocks are sustainably fished. Compared with the year 2000, before certification (Fig. 4a), many stocks have shifted from the ‘bad’ or ‘poor’ health areas to healthier states (Fig. 4b). Although at the start ‘pre-MSC’ stocks (i.e. stocks fished by fisheries that eventually will become certified) and stocks targeted by fisheries outside of the program had a similar state, those currently targeted by MSC certified fisheries have more noticeably increased their spawning biomass and reduced fishing pressure (Fig. 4). 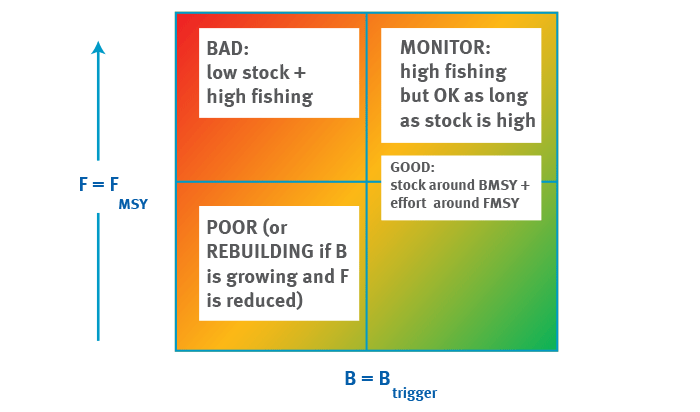 Currently, no MSC certified fishery targets stocks in the upper left quadrant. And stocks fished by certified fisheries tend to be under lower fishing pressure. Figure 4 shows that in 2014 most stocks appear to be in the ‘safe zone’ of the kobe plot, i.e., to the right side of the plot, hovering around the horizontal line. This demonstrates certification was appropriately awarded, and compliance with ICES advice and the EU Common Fisheries Policy recommendations. Looking at these figures, some points appear to be outside the bottom right “desirable” area, and it’s important to understand that these are still subject to sustainable management. For instance, for Arctic cod, although fishing is above FMSY, this is not a cause for concern because the stock biomass is extremely high, so it does not pose a threat to the population. 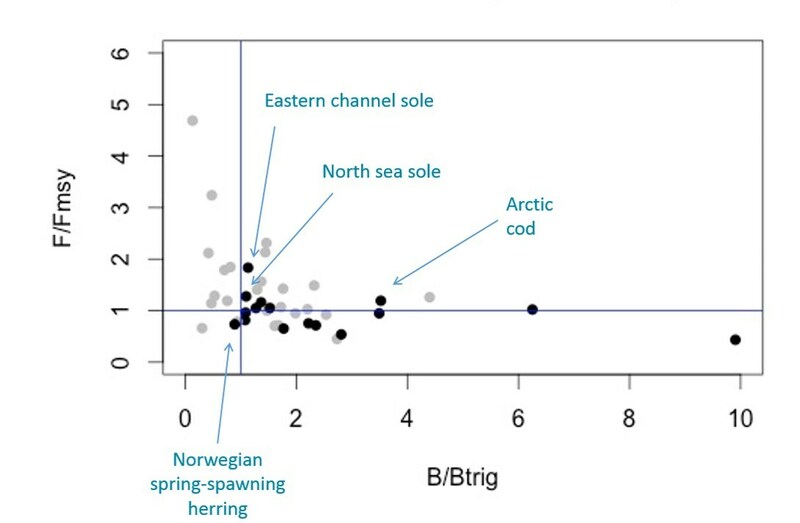 In the case of Norwegian spring spawning herring, biomass is below the threshold for management intervention, Btrigger. As a condition of its certification, this fishery was asked by certifiers to make improvements on management and harvest control rules in order to maintain certification. The declining trend in fishing pressure in recent years shows that there was a management response, and it is expected, based on stock status predictive models, that population biomass will respond. In order to manage natural resources, that are intrinsically dynamic, we need to consider a range of factors. Reference points are a pragmatic way to monitor fisheries and establish when fishing is posing a risk to the health of wild populations, and managers need to take action. However, it is always important to evaluate the full picture, and the evidence that the management system has robust and tested strategies in place to ensure that the fishery remains sustainable. A stock might be temporarily fished above FMSY but have such a high population biomass that this does not currently jeopardize the sustainability of the fishery. If a stock is below the biomass that should trigger management action, and there is evidence of rebuilding because there is increasing biomass and declining fishing pressure, this means there is effective management in place responding appropriately. This situation requires close monitoring to ensure rebuilding is eventually achieved, which is what the MSC Standard requires as a condition to renew the fishery’s certification, but it doesn’t trigger a certificate suspension as sustainability is not jeopardized. Another source of dynamic change is the advance in our scientific understanding of the biology of fisheries. The Dutch rod and line fishery for sea bass, for example, had its MSC certificate suspended when new scientific advice revised previous estimates of fishing pressure and stock biomass. The estimates revealed an unsustainable exploitation rate that could not be allowed according to MSC Standard requirements. The MSC certification process is designed so that changes in scientific advice can be incorporated in a timely way, while helping fisheries and other actors involved in processing, distributing, and selling certified seafood, understand and address these changes. Importantly, this process takes into account real world aspects such as the time lags in biological responses, and the need to allow for fishing effort reduction to be gradual in consideration of fishers’ practical constraints. The standard which fisheries need to meet in order to achieve MSC certification takes all these factors into account, in addition to considerations about ecosystem impacts, bycatch, and governance structure, based on internationally accepted scientific best practice. It has been developed in consultation with scientists, industry experts and NGOs to deliver the most credible and robust assessment of sustainable fishing. We regularly review and update our standards to reflect latest advances. This guarantees that when you buy seafood with the blue MSC label you’re getting exactly what the label promises: supporting environmentally sustainable fisheries. This article was originally published at the MSC Blog, May 25, 2016, by Catherine Longo.